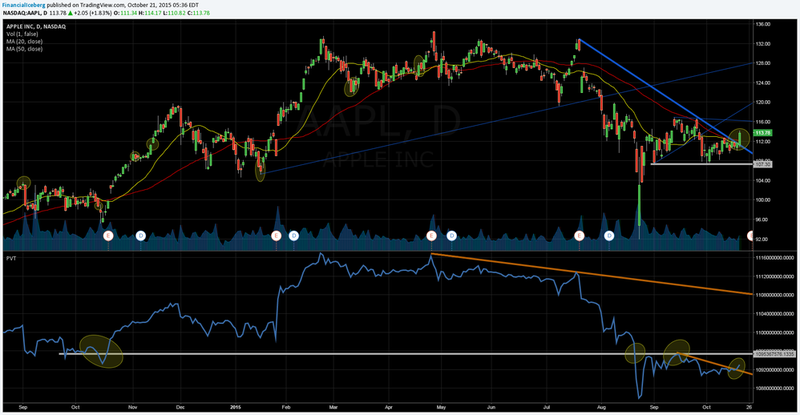 SPY ETF / AAPL Price Volume Trend: Apple Break Out ? ​in the chart below... The same idea for Apple Shares (AAPL). ​194.59 ( See First Chart Below - Top Panel - Yellow Line - Ellipse ) and the 50 DMA ( Day Moving Average ) on ​October 8 then at 199.84​ ​( See First Chart Below - Top Panel - Red Line - Ellipse )​ . ​We broke on October 6 the Resistance Trendline on SPY from August 18.